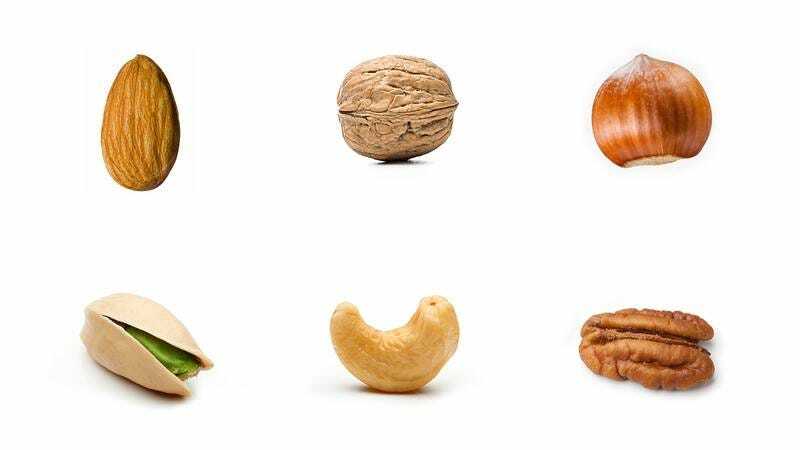 Get ready to see your favorite nuts ranked in order, and don’t worry about why they’re arranged this way. It’s a little too complex for you. Coming in at No. 1 is the almond. It occupies eight nodal points on our Nut Matrix, which is why it’s our primary nut. If that doesn’t make sense to you, well, that’s exactly what we expected. Your mind isn’t cut out for the intricacies of the rubric we used to create this list. We did the hard work of ranking the nuts for you so you wouldn’t have to think about it. You’re welcome. Taking the No. 2 spot are pistachios, thanks to an Adjusted Nut Index (ANI) value of 340 and cross-links between four nut nodal points. Listen, just stop trying to figure out what that means. You wouldn’t give a chimpanzee a microprocessor and expect it to understand how it works, and we don’t expect you to understand our nut ranking methodology. Look, we’re not trying to insult your intelligence. It’s just that our nut ranking system, the Nut Object Variance Analyzer (NOVA), is completely incomprehensible to a layperson. Take our word for it that NOVA’s nut rankings are over 99.99 percent accurate, and that it says that walnuts are No. 3. All right, you want to understand why cashews are No. 4. Here’s a simple analogy that maybe will help you grasp the basic gist of how we rank nuts. Imagine that a nut is like a bowling alley. Inside this bowling alley, you have 12 lanes. Each lane has a bowler, and these bowlers are the nodes on the Nut Matrix. When a bowler gets a strike, that node is activated. That make sense so far? So, to calculate that cashews are nut No. 4, we analyzed how many bowling pins exist in its bowling alley, how many of those bowling pins were positive or negative, and used that data to plot the Nut Adjustment Curve (NAC) of cashews on a graph. By studying the slope of the cashew NAC and combining it with historical records about nut flavor, nut snackability, nut shell thickness, and other factors, that allows us to produce what is called a “quantum nut spectrum,” which places the nut on the surface of an n-dimensional torus. We can then compare the cashew’s position on the torus to the known coordinates of other nuts on the torus membrane, and that allows us to arrange them in numerical order. Still follow? An important thing to keep in mind is that a nut hypertorus does not tell us the order in which nuts are ranked, it only tells us the orders that nuts are not ranked. By producing thousands of nut hypertoruses with adjusted variables for nut position, we can rule out inaccurate nut rankings through the process of elimination until we determine the one correct order that these nuts can be listed in. And that’s why cashews are No. 4. Got it? Maybe we lost you with that metaphor. Let’s try to simplify it for you. Nuts are like bowling alleys. We have a system that uses math to rank nuts, the way you use math to keep track of how many points you’ve earned while bowling. Okay? Nuts are like bowling. And our fancy math says pecans are No. 5. Pretty cool, right? No. 6 is almonds. Don’t worry about the fact that almonds were also No. 1. Almonds are simultaneously No. 1 and No. 6, because almonds occupy two different nut waveforms in probability space. But we’re wasting our time trying to explain this to you, aren’t we? Last but not least is the hazelnut. Wow. Learning that hazelnuts are No. 7 was pretty exciting for us. None of our preliminary models predicted this result. You won’t realize how huge it is that hazelnuts are nut No. 7, but trust us, this is a really big deal for anyone who actually understands how to rank nuts. It raises countless questions, opens up worlds of possibility. We will have to make many, many more of these lists.